Romina Rasmussen, Salt Lake City pastry chef and owner of Les Madeleine’s Patisserie, is the acknowledged queen of kouing-aman. 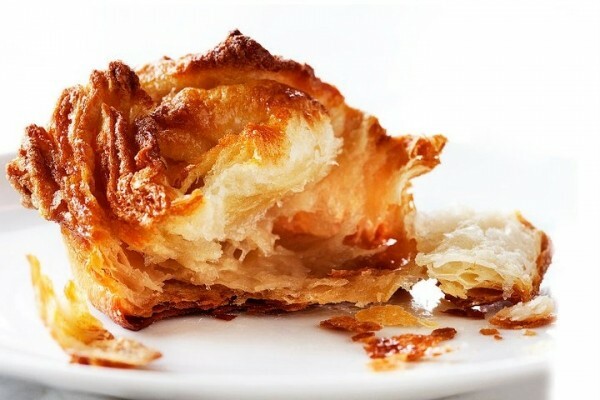 The buttery, sugary, crackly Breton pastry (with light gooeyness between the layers) landed her on Food Network and in O Magazine, to name but a couple of honors. I’m as big a fan as anyone of that addictive pastry, but at $5.50, let’s face it: It’s a bit of a luxury. So, I’m here to tell you that in between kouing-aman fixes, you can always find something to love among her original cookies. You could have one a day and not repeat yourself for a few weeks. From a mere 90 cents to $1.50, each is an affordable splurge. She adds a splash of orange-flower water to her light sesame cookies, and borrows the Moroccan technique of toasting the flour in the same pan she uses to toast the sesame seeds for extra flavor. Her finger-size cardamom cookie, loaded with cardamom and a hint of cinnamon, is perfect with a cup of Earl Grey. Butter toffee shortbread, studded with big butterscotch chips and housemade toffee (with a splash of dark rum) chopped to bits is incomparable. Seriously, sometimes that cookie is all you need to change your day. Rasmussen created her original black & white sesame cookie for the Chow Truck. It’s a not-too-sweet New York black & white cookie with glazes made from black and white sesame pastes from Japan. And her repertoire includes many more delicious flavors, because the queen of kouing-aman is also the queen of cookies.